A recent research revealed that one in three FMCG shoppers in India now take up a multi-channel approach while making a purchase. They first go online and then head to buy. You can say the Indian consumers are kind of spoilt for they have the choice like never before. They have become quite picky because of the explosion in the number of choices and that sticking to a brand is something they will only do if it has something special to offer. In fact, if you talk about numbers at present, you will find that innovative planning and strategy has the potential to help companies and manufacturers shift demand to the tune of $20 billion in key categories. 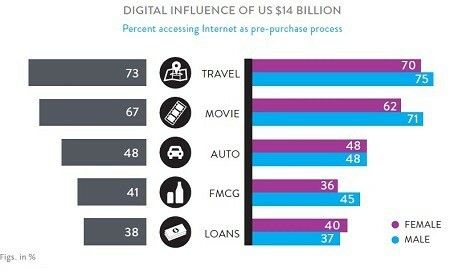 A few things that influence the spending patterns of consumers to a large degree are great deals, strong brand presence on the internet and productive person-to-person interactions, irrespective of whether they are buying fast-moving consumer goods (FMCG), movie tickets or automobiles, travel services, taking loans or building independent homes. And, so it really becomes crucial for companies to stand out and leverage the resources at disposal to get ahead in these three areas and make the difference that matters. Knowing the fact that promotions influence $10 billion worth of sales every year, marketers need to create the right message with intelligent deals that can win against competition. Prudent deals can brain wash a fifth and half of all shoppers irrespective of the product they are going to buy. Let’s say for example people shopping for FMCG, a large percentage of them experiment and buy a different product than planned due to discounts and promotions. In fact, if we talk numbers, at least 1 in every 4 shoppers buys more due to promotions offered. The research also revealed that from all those moviegoers who were surveyed, almost 80% said they made changes to their movie plans to take advantage of discounts and offers. Not just that, even when it came to loan products, promotions played a vital role. Figures say that promotional offerings made almost 31% of consumers to avail of loans earlier than they actually had planned. In fact, 44% of consumers that is more than two out of five wait for deals before they take out a loan. The study also found that even when it came to travelers they were seeking value for money and promotions than the lowest cost for choosing airlines and hotels. Discounts on current bookings and instant cash-back offers over loyalty points and special services generate the need for the services among travelers and incite their purchase decision. Even when it comes to building materials for independent homes, people in Tier II cities prefer to buy from certain stores because of their proximity and better prices. So, regional players play bigger roles as far as smaller cities are concerned. However, based on the behavior of such consumers companies can develop better insights about what to do to gain an edge. Indian consumers are becoming more and more dependent upon internet, whether it’s about hunting for information before making a purchase or actually making a purchase. A third to two-third of buyers hook up to this Information Superhighway for their pre-purchase activities. May be the volume of sales is not that impressive as of now but as far as seeking information on the web before making a purchase is concerned, it is extremely popular. Remarkably, influential affluent shoppers hinge on the Internet for their information, stressing the need for companies to build brands online. It is estimated that the influence of digital spaces will be somewhere around $14 billion.